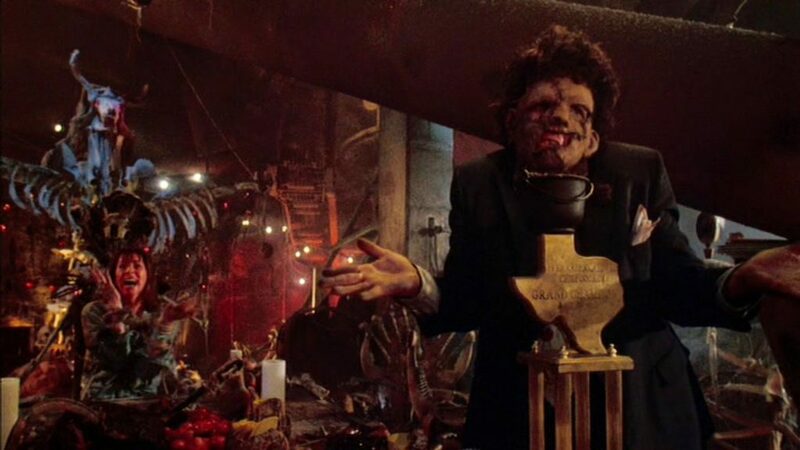 Blu-ray Review: ‘The Texas Chainsaw Massacre 2’ Collector’s Edition! The original ‘Texas Chainsaw Massacre‘ is one of the best horror films of all time. It still holds that title to this day. One thing most people don’t realize though is that the original film was made in such a way to evoke terror and horror, that it was filmed in such a manner as to show almost not gore, blood, or violence. It was all left off-screen for the most part. In return, this was a low-budget independent horror film that was fast-paced, horrific, and wildly entertaining, if not scary-as-hell. It truly is one of the perfect horror movies. some twelve years later, the original director Tobe Hooper came back and directed a sequel titled ‘The Texas Chainsaw Massacre II‘. I’m going to say Hooper was a smart man, because, I would guess that he knew he couldn’t recreate or one-up his previous horror masterpiece, thus he went in an entirely different direction with part II. This decision at the time didn’t do so well financially or critically, but over the years, this Part II has gained a ton of love and loyal fans, becoming a horror fan favorite, and showing just how genius Tobe Hooper was at the time. ‘The Texas Chainsaw Massacre II‘ is basically the opposite of the original film. This sequel has oceans of blood, ultra-violence at every turn, and over-the-top silliness that more or less makes this sequel and dark comedy, rather than a straight out horror film. The thing is though, it completely works. The opening credit sequence tells us that the murderous family from the original film is on the run and that there is no evidence of them or Leatherface. Also it says ten years have passed when we come across two well-dressed young guys, driving like lunatics down the highway, acting ridiculous, when they call the local radio station and hassle DJ Stretch (Caroline Williams). As they are in the car and on the phone with DJ Stretch, they come across Leatherface and his family in the car next to them and are brutally killed. Meanwhile, a local police officer, Lt. Lefty (Dennis Hopper), who is the father of a couple of victims from the first film, is out to seek revenge and justice for his dead kids. That’s when we see Drayton (Jim Siedow) from the first film, winning a BBQ contest with some questionable ingredients, Chop-Top (Bill Moseley), the hitchhiker from the first film’s equivalent, and of course, Leatherface. They seem to have abandoned their house and have taken up residence in an abandoned carnival attraction, where the lights and rides still mostly work. They go out of their new home and into the streets to reek havoc this time as Lt. Lefty and DJ Stretch try to stay alive. It’s mostly over-the-top and doesn’t have the low-key feeling as the first film by any means. There is a lot of humor in this one too, though it is very dark humor of course, but it works. Hooper takes the iconic dinner table scene from the first film and out does himself in this go-around too, which leads to a crazy climax. Makeup guru Tom Savini provides enough blood, guts, and entrails for three films here, so there is never a shortage on blood either. ‘The Texas Chainsaw Massacre 2‘ fits perfectly with the first film and works on almost every level, because it just isn’t some poor re-hash of the original masterpiece, but something different entirely, as it tries to poke fun at itself, as well as show some undertones of the social and sexual climate of the 80s. Still, it’s a damn fine film. 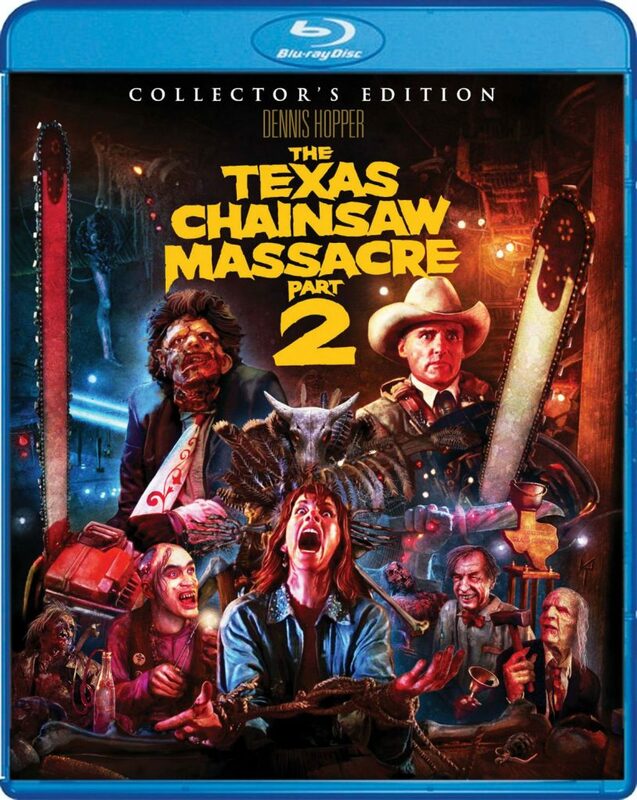 Scream Factory gives us the 2nd release of ‘The Texas Chainsaw Massacre 2‘ in the form of a collector’s edition. The first release was not all that long ago from MGM. With the Scream Factory treatment, we get a new high-def transfer and a new audio mix, complete with a treasure trove of extras. I must say, that this is the one to own, if you’re going by video and audio presentations alone. This new transfer was made from a 2K scan from an interpositive negative, which results in a rather fantastic video presentation. The makeup effects along look incredible, as you can see every bloody gash, wound, and individual oily piece of hair on everyone’s faces. It’s quite grotesque and a lot of fun to watch. Facial features on the normal people are exquisite as well, showing wrinkles, age spots, and freckles nicely. Wider shots also have some depth and never looks soft whatsoever. It’s really impressive the amount of detail in the makeup and costumes, and of course the leather mask on Leatherface you can see in this new transfer. Colors look great as well and seem to be brightened up a bit from previous releases. It looks more natural and realistic now. The holiday lights inside the family’s lair boast with primary colors, where the radio station looks vintage and stable. Black levels are deep and inky and the skin tones are natural, with the exception of the heavily make-up’d killers. There is a nice even layer of grain, keeping with the filmic quality as well. There were no major issues with banding or aliasing either, making this video presentation an excellent one. Scream Factory has included two different audio mixes here. One is the 2.0 stereo version and the other is the fully immersive DTS-HD 5.1 mix. Both sound excellent, but I prefer, as always the 5.1 option, because it takes the soundscape to a whole new level in surround sound. The 5.1 mix has a wider range here. Sound effects are robust and loud, but are also layered. The chainsaw sounds roar with ferocity and provide a deep growl as well, especially when it slices into something. There is also a ton of screaming in this film, almost too much, but it’s all handled well, and never hits that tin note, which is always nice. The other action-horror scenes sound fantastic and have some great directionality. The bass kicks in as well and provides a depth that hasn’t been there before in the sound effects or the excellent rock/punk music selection. Dialogue is always crystal clear and easy to follow, even over all the screaming. The LFE is excellent and the dynamic range is very wide, leaving this audio presentation with excellent marks. Audio Commentaries – There are three different audio commentaries to choose from here, all of which are fun to listen to. The first commentary is with director Tobe Hooper as he does a Q&A type of commentary with director David Gregory. They talk about the different route part II took as well as some trivia and the overall production history. 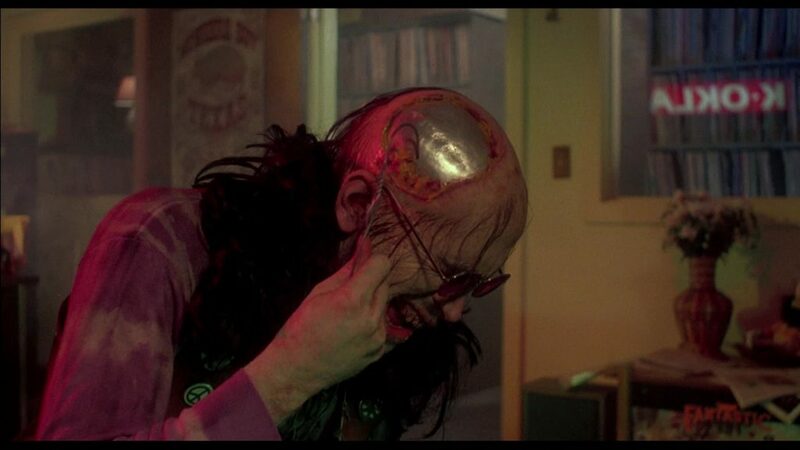 The second commentary track features makeup effects master Tom Savini and actors Bill Moseley and Caroline Williams. This is a very entertaining track to listen to with tons of laughs and anecdotes from the set. There is never a lull or dull moment in the conversation. The third commentary is with cinematographer Richard Kooris and a few other crew members. They talk about the technical aspects and some fun stories from the set throughout their commentary. ‘The Texas Chainsaw Massacre II’ (HD, 101 Mins.) – In addition to this Scream Factory Collector’s Edition, you also get the MGM edition from a few years ago. ‘It Runs in the Family’ (HD, 88 Mins.) – This is an AWESOME documentary about the making of the film that is separated into six parts, which can be viewed individually or all together. This covers every aspect of the production from makeup to the script, to the locations, and everything else in between. There are a ton of new interviews with the cast and crew as well. House of Pain (HD, 43 Mins.) – This one has interviews with the makeup effects masters that worked on the film and how they made each of the practical effects and masks. Horror’s Hallowed Grounds (HD, 25 Mins.) – Here we have a professional horror writer traveling around to the various locations used in the film and what they are and look like today. Plays like a reality show. Yuppie Meat (HD, 20 Mins.) – Actors Chris Douridas and Barry Kinyon discuss their characters in the film. They played the idiotic young men at the beginning of the film. Their reflections are quite funny. Cutting Moments (HD, 17 Mins.) – The editor of the film talks about his work on the film and some stories that he remembers from the set. Behind the Mask (HD, 14 Mins.) – Bob Elmore who played Leatherface in this film, talks about wearing the mask, running around with a chainsaw, and working with everyone. This is very enjoyable. Behind the Scenes Footage Compilation (HD, 44 Mins.) – This is a montage of the cast and crew working out scenes and rehearsing. ‘It Runs in the Family’: Extended Outtakes (HD, 30 Mins.) – There aren’t any bloopers really, but more like deleted scenes and interviews. Alternate Opening Credit Sequence (HD, 2 Mins.) – This is a darker and scarier opening credit sequence with different music. Deleted Scenes (HD, 11 Mins.) – These are some amazing gory and bloody sequences that were left out for rating purposes. So awesome. Still Gallery – Images from the film, promo art, and behind the scenes. Trailers (HD, 6 Mins.) – Trailers for the film. Scream Factory’s ‘The Texas Chainsaw Massacre II’ is one hell of a release. They really out-did themselves with this one. The film itself is brilliant, as it went in a completely new direction than the original film, thus standing on its own and not on the coat tails of something else. It has enough blood and guts to make up for how little the original film had too, plus some excellent new characters that have become iconic in the horror world as well as an over-the-top, dark comedy feel. It’s quite entertaining. The video and audio presentations are also top notch and the film has never looked better. Then there is the treasure trove of extras here, all of which are outstanding and worth watching. We are talking like over twelve hours of amazing extras here. This is a MUST-OWN! Blu-ray Review: ‘The People Under The Stairs’! 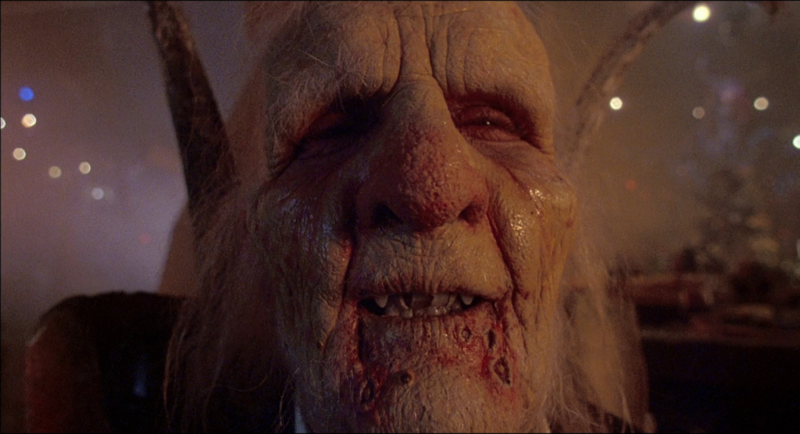 Blu-ray Review: ‘Poltergeist II’ Collector’s Edition! This entry was posted on Tuesday, April 19th, 2016 at 1:41 pm	and is filed under Film, News. You can follow any responses to this entry through the RSS 2.0 feed. You can skip to the end and leave a response. Pinging is currently not allowed. « Eric McCormack Leads Time-Travel Series For Netflix!!! Mr. Ness! Any comment for the record? I just happened to be there when the wheel went round.